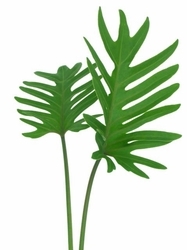 This tropical green is very unique with its' catchy design and small green foliage. Each leaf is 6"-10" in length. This item works well as a filler for an arrangement or in a vase by itself. This item will stay fresh for 2-3 weeks! This item can be ordered by the bunch.